The round trulli, the famous old farm buildings that have become the symbol of Puglia, were constructed with local stones, collected and cut to shape, and then the thick, dry stone walls were constructed by laying the stones one on top of the other without cement using a special technique. They were often provided with an insulating gap filled with earth to keep the interiors cool in the summer and warm in the winter. Borgo dei Trulli is in the valley called Valle dell`Itria 3 kms form Cisternino and from the baroque town of Martina Franca and 5 kms from Ostuni, in a splendid spot among the thick vegetation provided by the oak and olive trees growing in the red-coloured earth, a beautiful drive through the countryside close to the sea which is 15 kms away. The borgo consists of some trulli and other typical local buildings around the furnished garden. The interiors have been renovated carefully maintaining the original features, and the furnishings are of excellent quality and are highly refined. The well-equipped kitchen is equipped with a dishwasher and other accessories include satellite-TV and a washing-machine. Outside, besides the 6x12m swimming-pool there are also panoramic relaxation areas in the garden and a large gazebo with a round table close to the swimming-pool. Guests can also request a cooking service in the evening, a baby-sitter and a laundry service. Brindisi airport is 25 kms away and Bari 70 kms. 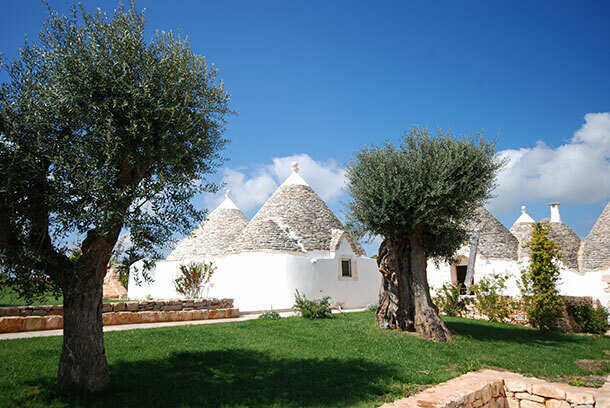 The complex consists of five trulli and other typical local buildings joined together around the garden. Well-equipped kitchen with dishwasher, living-room with sofas and satellite-TV, large dining-room, 4 double bedrooms with bathroom with shower, 1 twin bedroom with bathroom with shower. Outside there is a large gazebo with a round table for dining outside.